West Chester, Ohio, USA; June 2017—Color-Logic--the leader in metallic color communication and decorative effects--has partnered with Vivid Laminating Technologies--the leading European manufacturer of laminating equipment. 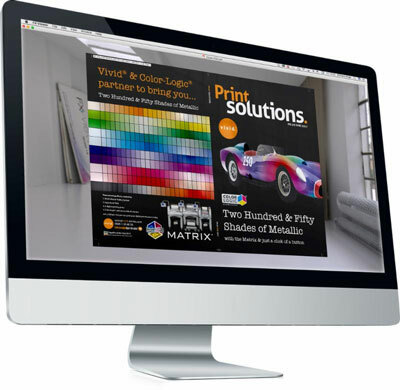 As a result of the partnership, any color digital printer can now produce 250 different metallic colors from a single roll of foil, using the Color-Logic Design Suite and the award-winning Vivid Matrix Digital Foiling and Laminating System. Vivid offers both silver and rainbow holographic foils for this purpose. Discussing the technique, Color-Logic Director of Sales and Marketing Mark Geeves commented: "The partnership of Color-Logic and Vivid Laminating Technologies enables any CMYK digital printer to produce 250 different metallic foil hues and gradations with their existing inks and toners. The attention-commanding brilliance of conventional cold foil is enhanced by the many Color-Logic special effects available to designers, and the simplicity of the Vivid system makes digital foiling available to anyone with a digital printer. The key benefit of the Color-Logic and Vivid partnership lies in the ability of printers to produce higher margin products with their current equipment, as well as attracting profitable new customers." Vivid Laminating Technologies was voted 2016 Supplier of the Year by the British Association for Print and Communication. Vivid is the leading European designer and manufacturer of digital foiling and laminating systems, supplying to the printing industry for more than 30 years, and exporting to more than 50 countries worldwide. For more information, visit www.vivid-online.com or call +44-1530-510946.